Authored by experts in the field, this brand-new reference presents a systematic approach to which flap or graft to use in which clinical situation and how to cut and move the skin. More than 350 full-color photographs and line drawings offer you step-by-step guidance. And, a DVD containing high-quality video clips demonstrates reconstructive procedures, including cutting, positioning, and suturing of flaps and grafts. 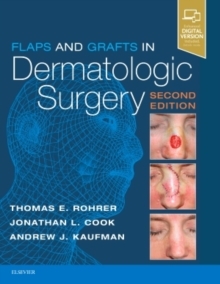 Describes which flap or graft to choose in specific clinical situations, how to execute each repair (with a multitude of images and diagrams), and how to minimize the risks as well as manage potential complications. Provides algorithms to assist with flap and graft choices, as well as hundreds of superb full-color illustrations throughout. Includes an all-new chapter on Surgical Complications and Scar Revisions. Includes access to high-quality videos showing exactly how the flap/graft is incised, moved, and sutured. New videos include the Rhomboid Transposition Flap for Defect on the Lower Lid, the Island Pedicle Flap with Canthal Suspension, and the Primary Lid Repair with Diagonal Tarsal Suture Sine Marginal Sutures. Expert ConsultT eBook version included with purchase. This enhanced eBook experience allows you to search all of the text, figures, and references from the book on a variety of devices.